Matt with Apex did a outstanding job on our outdoor living space project in the back of our house. Such a great job, that we have now hired him again to do some more work in the front of our home. I can't wait to see how he ties both projects together. 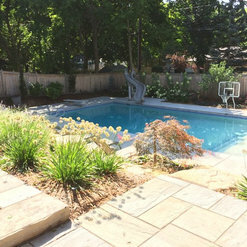 Our backyard looks absolutely awesome, we could not have been happier with their work. Despite the rain, they were able to finish our project in a very timely matter. Matt is a nice guy, but I wounld not recommend him for landscaping. Hired and paid him a deposit 2 years ago; he never finished the job. The quote saids 10 days to complete. 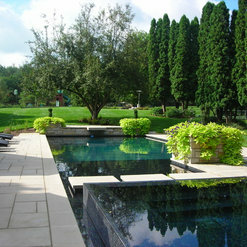 At Apex Landscape we do our best to make our clients happy. It disappoints us greatly to have unsatisfied clients. However in this particular case we did complete all work that was paid for by the client and none of our contracts have ever, or will ever have a "to be completed in 10 days" line in them. Apex Landscape, as represented by owner/operator Matthew Schmuker, went above and beyond and fully upgraded our Brooklyn patio from a smelly old eyesore to a place of beautiful peace. What was once a rectangle dump is now an urban oasis. After a full interview, he provided my wife and I with a couple different drawings in addition to suggestions for furniture, planters, plants, flowers and vegetables based on our answers. We used most of his recommendations but subbed in some of our personal favorites, which didn't phase him at all. Turns out, Matt had checked his ego at the door. The morning of what we now call "The Immaculate Transformation", he arrived ready to haul out the junky planters (all 27 of them) the previous owners had left. Matt was not afraid to get his hands dirty from the word go (in fact he didn't even wear gloves!!!!). What followed can only be described as "gamechanging". Trying to find a respite from the insanity of the city isn't easy but now we have our own little "slice of heaven" right here in Brooklyn, U.S.A.. Thanks Apex! I had Apex to my house to estimate putting in 2 pines trees in my backyard Spring of 2013. He gave me a quote for 2 trees with a 1 year warranty. I was cancelled on 5 times with very little communication for the original install. After 3 months one of the trees died. When I called to redeem the warranty and get the tree replaced, he scheduled me and cancelled on me over a dozen times, each time with little to no communication or notice. I finally drove to their office space to pick up a partial reimbursement check after realizing that he would never replace my tree. He never answered or returned my phone calls- occasionally he would send a text or brief e-mail. This is a simplified version of my TERRIBLE experience for the sake of brevity. I have never received such awful service! 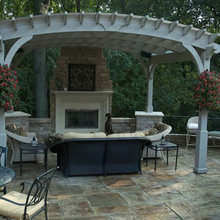 Matt from Apex Landscape has a talent for dialing in a design to fit the unique aspects of a home whether it is on a lake or in the heart of the city. 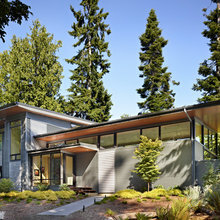 As a custom home builder and renovator, I have worked with Matt on various projects through the years and have always found his designs and implementation first rate. I would recommend Matt and Apex Landscape to other builders and homeowners seeking a landscape professional for their project. 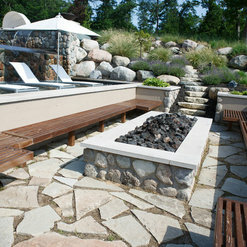 We recently worked with Apex Landscaping to design and construct an outdoor patio, grill and bar area. The job required demo of an existing patio and removal of those materials. We absolutely love the finished product and can't stop looking at it! 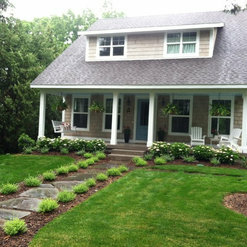 Matt of Apex Landscaping was professional and cooperative throughout the process. The only negative was that it was difficult to coordinate the details of the project considering our residence location was not near Apex. Overall, quality of the materials and workmanship are excellent and we would highly recommend Apex Landscaping for your upcoming project(s). Great experience. Excellent outcome with our hardscape. Matt was very professional and understood our needs. I'd highly recommend Apex to anyone. 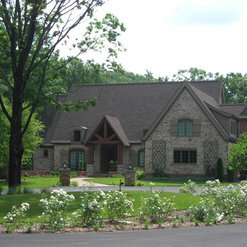 I have worked with Matt S. for many years on various projects throughout the greater Grand Rapids area. He is very professional and does great work. Call him for all your landscape needs. 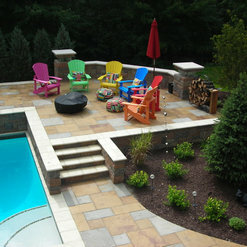 Apex performed the landscaping for my backyard pool area. 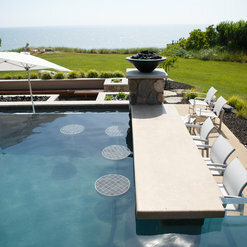 I was really pleased with their teamwork and creativity designing the "fit" of the pool area to match our home. 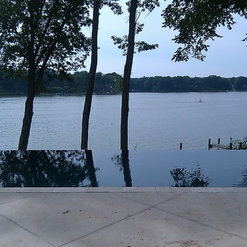 The flow from the house to the pool is seamless. The trees, plants and artificial turf have matured over the last couple of years and makes our little backyard look like a tropical paradise in the summer months. 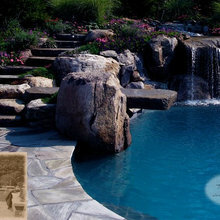 The pool company often shows our backyard to prospective clients. Thanks, Matt for an excellent job! 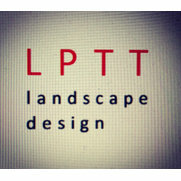 One of the most talented and knowledgeable Landscape Designers I ever have met and worked with.” I would highly recommend Matt!!!! Commented: Pool CoverIT does have a winter bungee cover that attaches to the concrete with tie downs. it stretches over the wall. We had it custom made. There is no track on the wall. Commented: What color & brand is plaster finish?It is onyx by Diamond Brite. 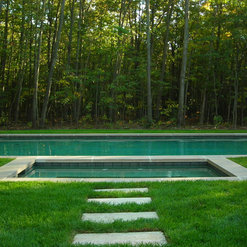 Commented: Any ideas of the approximate cost of the pool install?Approximate Project price which includes pool, landscape, fence, etc was around 450,000. Commented: SPAYes. The entire spa is glass mosaic tile.